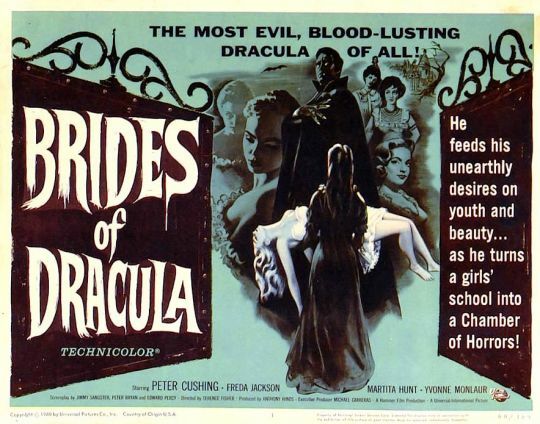 Let me start by saying this, not all Hammer Horror films are great. There are a couple that people know off the top of their heads and when people think about Hammer Horror they immediately think of Christopher Lee as Dracula, which is great don’t get me wrong. 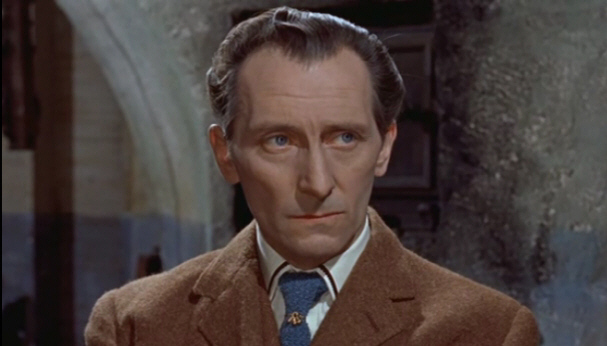 Horror of Dracula is probably one of my favorite Hammer Horror film, but to me Peter Cushing trumps Christopher Lee in spades. Enough with the gab. Here is how The Brides of Dracula awesomely plays out. Marianne (Yvonne Monlaur)is on her way to a boarding school to become a teacher. After entering a small inn, the barkeep warns her to not travel alone, and to quickly return to her coach. Unfortunately for Marianne, the coach leaves without her, and she is forced to stay at the in. After being offered food, and a ride to another place that she could stay, the Baroness Meinster (Martita Hunt) enters, welcomes young Marianne to spend the night in Castle Meinster where she resides alone, and promises to get her to her school early in the morning. Upon arriving at the castle, Marianne ventures to the balcony adjacent to her room, where she sees a young man across the courtyard on his own balcony. She questions Baroness Meinster about him, and is told that he is her son, the Baron Meinster (David Peel) and he remains on that side of the house, as he is mad, and has embarrassed her so that she cannot have any more guests or parties in her castle. In a subtle sort of way, she is given a warning, not to enter the Baron’s half of the house, but what kind of a movie would it be, if she followed the rules? After waking up in the middle of the night, she sees the Baron on his balcony, and thinking he is going to throw himself off of it, she rushes down the stairs and into his part of the house. What she finds is the Baron, chained to the wall, where he asks her to get the key from his mother’s room, and help set him free. Apparently, he is the heir to most of Transylvania, and his mother’s jealousy forced her to keep him locked up, encouraging the rumor floating around the town that her son is dead. Needless to say, Marianne helps set the Baron free, setting the movie in motion. After the Baron confronts his mother, and they leave, Marianne gets dressed and returns to his room. There she finds Greta (Freda Jackson) the maid, laughing hysterically, seemingly mad now that the Baron has escaped. Marianne discovers that the Baroness is dead, and takes off, running blindly into the woods all night and into the early morning, where she collapses from exhaustion. Shortly thereafter, a coach rolls by, containing the infamous Dr. Van Helsing (Peter Cushing) who is still on a quest to rid Transylvania of all vampires. After Marianne tells Van Helsing of what happened to her the night before, we find out that the town’s priest has already summoned Van Helsing, to investigate the strange happenings in the town. This entry was posted on December 13, 2009 at 10:42 pm and is filed under Lost Classics. You can follow any responses to this entry through the RSS 2.0 feed. You can leave a response, or trackback from your own site.